It’s no secret that our love for Doctor Who could fill a Tardis. Plus we like cake a lot too. And with new Doctor Peter Capaldi and a 50th anniversary special on the way, what better excuse could you need for a party in time and space? 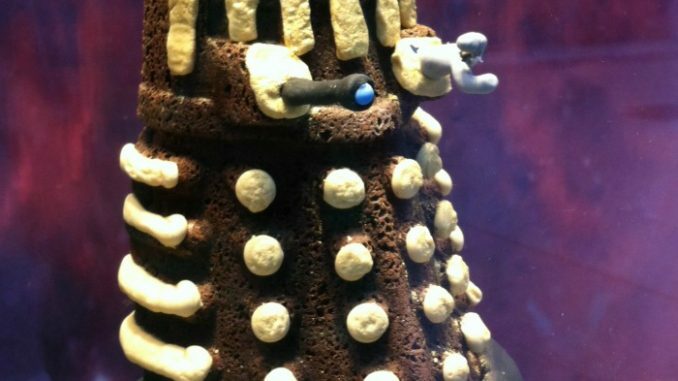 So when I heard about something that brings together both cake AND Doctor Who – well, I pretty much had to go and have a lie down in a darkened room to recover. 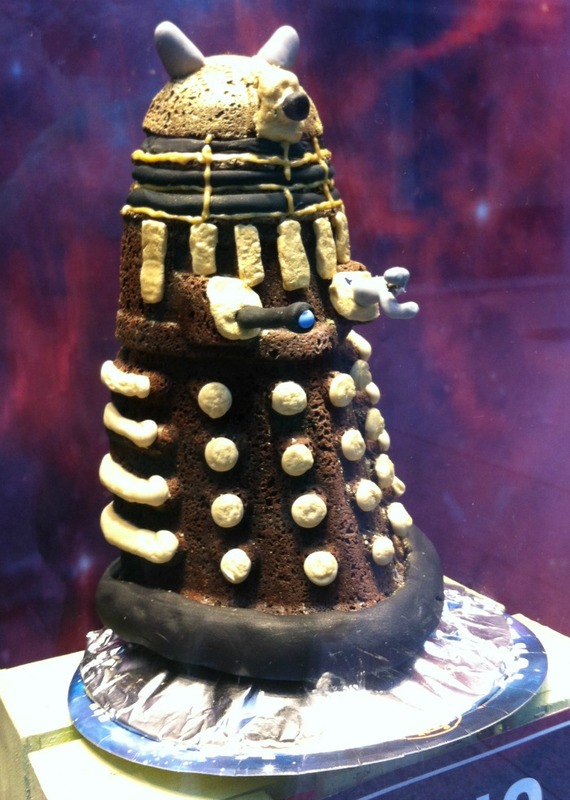 Let me introduce you to Lakeland Limited’s new range of Doctor Who bakeware. They’ve got everything from Tardis chocolate moulds to Weeping Angel bunting. Perfect for a tea party on Gallifrey. 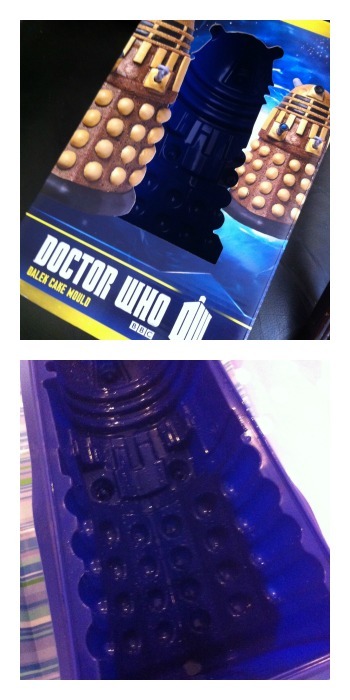 We were sent a Dalek silicon cake mould from the range to try out. Unfortunately, Daleks being tricksy beasts, it didn’t go entirely to plan. On the back of the box it simply says Requires an 8 egg cake mix and from there you have to work it out for yourself. There’s a great decorating guide for this cake on the Lakeland website, and I think it would be really helpful if they added a more detailed cake recipe too. 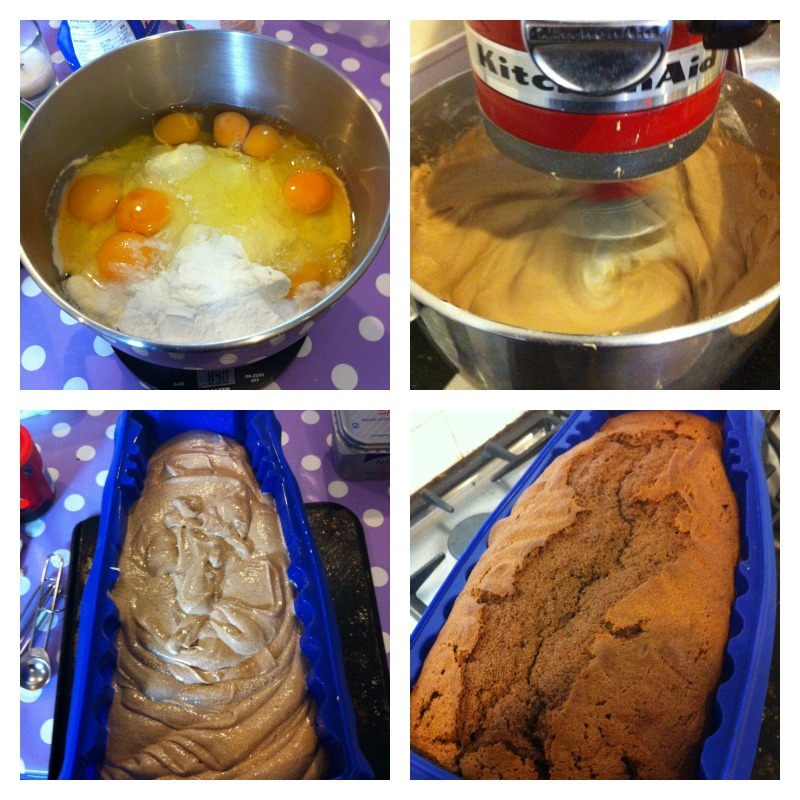 I used a four egg Mary Berry chocolate sponge cake recipe and doubled up the quantities. This resulted in an enormous cake mix that barely fitted into the mixing bowl, but as you can see from the pictures this is a massive cake mould so it needed that much mixture to fill it. It was quite good fun to make as you could shout Eggsterminate! quite a lot and nobody would object to your face because they all wanted some cake. And I had no idea how long to put it in the oven for – does twice the mix equal twice the cooking time? In the end it took an hour to cook. It was when we came to extract our Dalek that the trouble started. Even though we had greased the mould as instructed, most of the fiddliest parts of the pattern stayed stuck to the sides. It really didn’t look like a Dalek, it looked more like the Captain’s log. We didn’t waste it though. It wasn’t very elegant but it still tasted good as we exterminated it. If you want it for Matt Smith’s leaving party, maybe do a trial run to practice. Time Lords are used to trials. Don’t attempt to remove the cake until it’s completely cooled. I suspect impatience was a factor here.